Ryan Smith The Illinois State Museum has remained shuttered since November. Ryan Smith Some of the historic houses of the Lincoln Home National Historic Site are closed for repairs or are inaccessible. 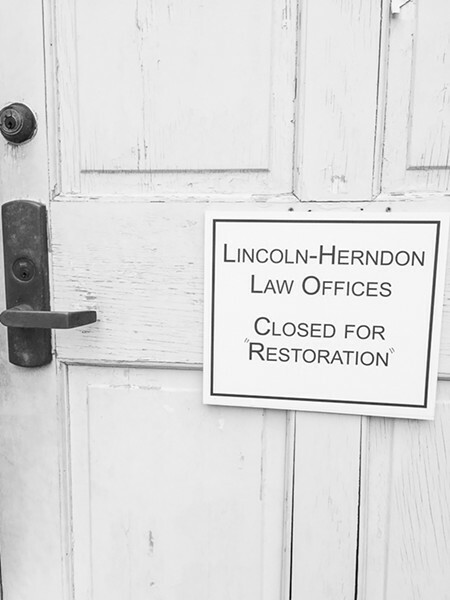 Ryan Smith Officially, the Lincoln-Herndon law office is listed as closed for renovations, but state workers told us the historic site is actually a victim of state budget cuts. 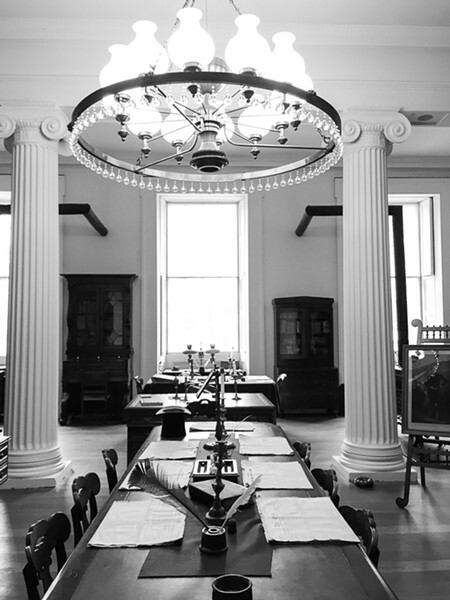 Ryan Smith A peek inside the Old State Capitol, which is now a museum of 19th-century Illinois legislation. Ryan Smith A statue of Abraham Lincoln in front of the State Capitol looks appropriately somber considering the depressing state of downtown Springfield. Ryan Smith Parts of downtown Springfield look like an 1850s-themed ghost town. 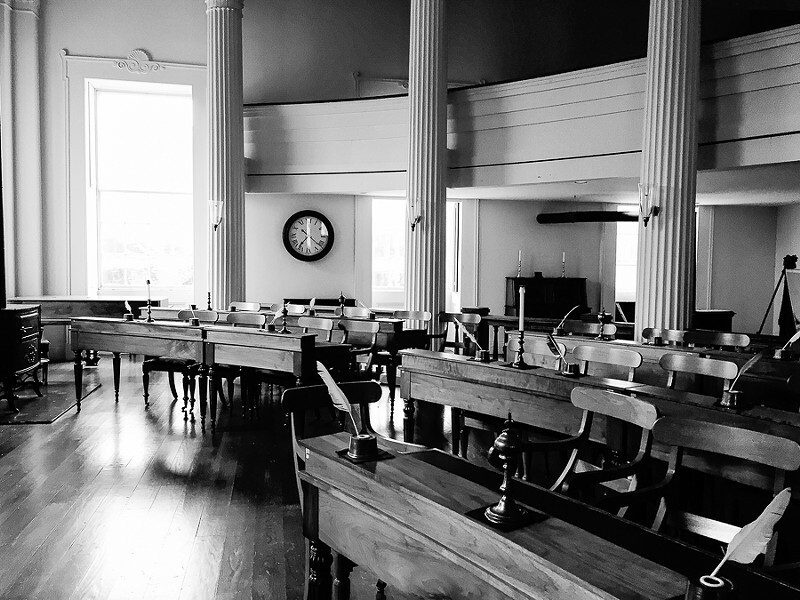 Ryan Smith The empty chambers of the Old State Capitol, where state lawmakers signed the 13th amendment in 1865. Modernity and history comingle uneasily in downtown Springfield. 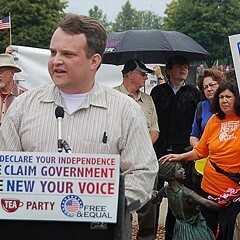 State workers, lobbyists, and tourists pass along a patchwork quilt of ordinary paved roads and old-timey cobbled boulevards dotted with Subways, Starbucks, Abe Lincoln statues, and souvenir shops. The servants of the state go about the government's business in mundane-looking office towers or under the silver dome of the capitol building, while visitors shuffle in and out of structures crafted to resemble the city from our favorite son's pre-Great Emancipator days—including the Old State Capitol that's now a museum of bygone legislation. 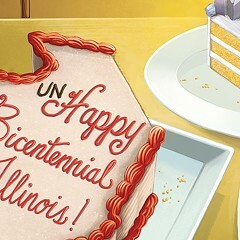 Illinois's capital city is a place that increasingly resembles a northern version of Colonial Williamsburg. As Springfield's major industry keeps on contracting and my hometown continues to be bedecked with mid-19th century garb, I've sometimes feared the past might someday fully swallow the present, permanently transforming the seat of our state government into an eerie Lincoln-themed ghost town. 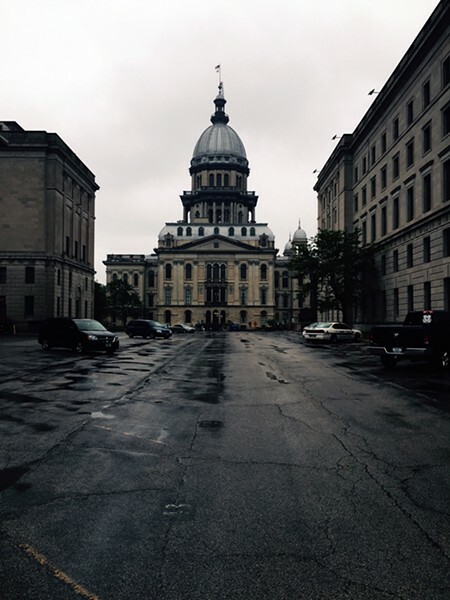 During a recent trip to Springfield, I realized that day may have come already thanks to the dark reign of our Great Plutocrat, Bruce Rauner. 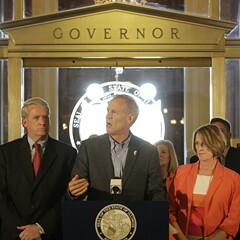 From his base of power at the redbrick manor on Old Aristocracy Hill, the governor has treated state employees like the barbarians at the gates, and has been all too eager to use Illinois cultural institutions as pawns in his budget chess match with Democrats. Wading into Rauner's Springfield on an appropriately dismal Saturday morning, I was one of the few human beings in sight in the rain-drenched city center—at least outside the comforts of Boone's Saloon, a once-shuttered dive bar that reopened after renovations in 2011. It's a place whose former charms have been polished off by a gimmicky old-west theme and dozens of flat-screen televisions blaring ESPN. 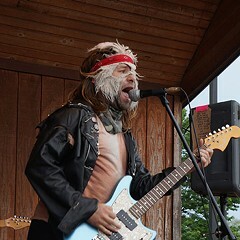 There were cheap drink specials, though—and I'd need the alcohol to steel myself for the harrowing journey into Raunerville. Umbrella in hand, I left Boone's for Young Mr. Lincoln's old hood, now the 12-acre Lincoln Home National Historic Site. 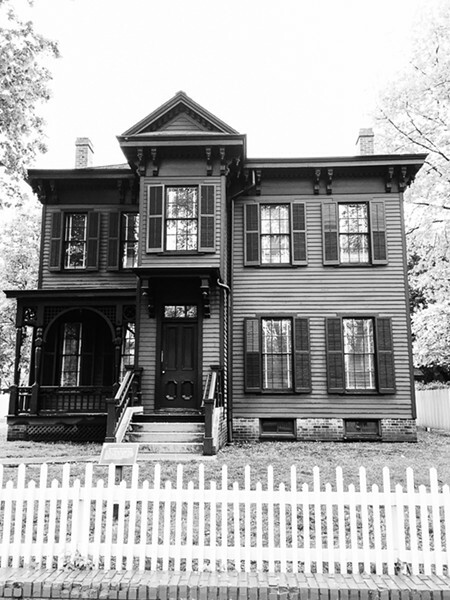 All the houses and yards in this four-block area are meticulously preserved and restored to look as they might have when Abe and family resided there in the mid-1850s. 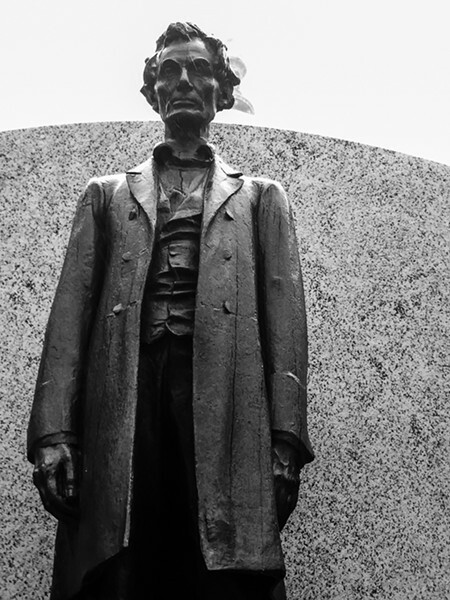 Part of what's impressive about Lincoln's crib is its modesty. It's no log-cabin hovel, but compared to the splendor of Thomas Jefferson's Monticello or George Washington's Mount Vernon, Lincoln's two-story Greek Revival and white picket fence feels extraordinarily ordinary—which perfectly fits Honest Abe's humble reputation. What's striking, however, is the emptiness: At one of Springfield's main tourist attractions, just a handful of curious tourists milled about. The only sound was the crunch of the gravel road beneath my feet. Could this desolation be just an anomaly? Yes, said Timothy, a graying man behind the counter of the visitor's center. It was a rainy Saturday during the tourism off-season, he noted. Most of the effects of Rauner's reign on downtown Springfield, he told me, were more subtle—like the fact that there's only one docent per shift at Lincoln's New Salem, a reconstruction of the rural village Abe called home in the 1830s. "If you know what to look for," he said, "you can see the problems." Timothy was right that the Old State Capitol building and the Lincoln Presidential Library and Museum would be relatively bustling—especially the latter site, where historic artifacts and documents take a backseat to what can only be described as a Lincoln theme park, replete with a holographic movie theater and creepy animatronic characters. The museum gift shop especially was teeming with out-of-towners gawking at black stove-pipe hats and Abe and Mary Todd salt-and-pepper shakers. 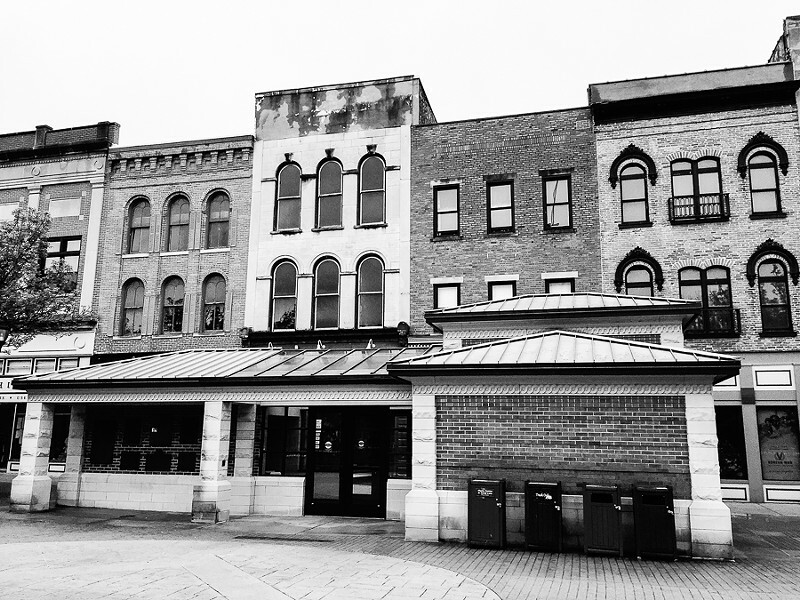 But elsewhere, there were unmistakable cracks in downtown Springfield's foundation. The historic office on Sixth and Adams where Lincoln and junior partner William Herndon once practiced law was closed, with a sign that read closed for restoration. Upon closer inspection, it was clear that a state employee with a dark sense of humor and access to a Sharpie had jotted quotation marks around those words—a wry commentary on the true nature of the site's closure. The Illinois State Museum, of which I have fond memories from grade-school field trips, was also shuttered. (The imposing, massive woolly mammoth replica and the dioramas depicting the daily lives of Native Americans living on the prairie thousands of years ago are images burned into my brain.) Rain dripping down the letters of the museum's name etched into the building's granite exterior gave off the appearance that the structure was actually crying. 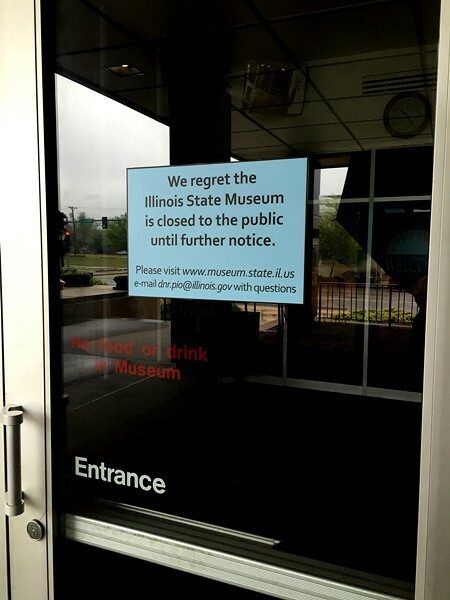 A sign affixed to the locked front doors delivered the bad news: we regret the illinois state museum is closed to the public until further notice. Also inaccessible was the home of early-20th-century traveling troubadour Vachel Lindsay—a School of the Art Institute of Chicago grad who pioneered a kind of theatrical, repetitive spoken-word form that was arguably a precursor to slam poetry and hip-hop. Springfield historians have since sanded the edges off Lindsay. He's now almost exclusively known for his laudatory poems about Lincoln ("the quaint great figure that men love / The prairie-lawyer, master of us all," he wrote in "Abraham Lincoln Walks at Midnight"), yet he was something of a bohemian radical in his time who advocated for racial equality and labor rights. But fame was fleeting for Lindsay. Shortly after returning to Springfield in 1931 from performing during a grueling six-month road trip, exhausted and penniless, he committed suicide in the house by drinking a bottle of drain cleaner. A note posted on the front door of Lindsay's home announced that tours were available by appointment only, during a two-hour window on weekends, and to call the nearby Dana-Thomas House to set up a showing. Arranging a guided tour for one seemed silly, but I decided to head over to the Frank Lloyd Wright-designed mansion to inquire within. Entry to the halls of the Dana-Thomas House wasn't a sure thing. 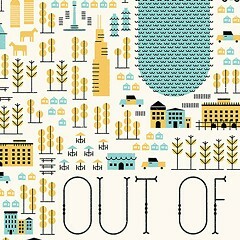 It had been shuttered for 18 months in 2008-'09—yet another victim of state budget cuts. When I didn't spot a soul in the grassy courtyard, I figured that Rauner had shut it down too. But the heavy wooden door leading to the guesthouse budged open, and I was pleased to see a dozen or so people awaiting a tour. The 1903 home isn't Springfield's most grandiose structure—it lacks the old-world opulence of the Illinois State Capitol—but it's by far the most interesting. The famed architect remodeled Springfield socialite Susan Lawrence Dana's home during the height of his Prairie style, giving the formerly Italianate mansion a certain humility by blending it somewhat into the natural landscape. The wide-open floor plan and dearth of interior doors mean the 35 rooms evoke a communal feeling missing from most mansions. 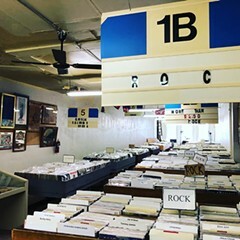 From the third floor, visitors can peer over a wooden balcony and see into the basement, which contains quirky treasures like a duckpin bowling alley. Wright's understated whimsy feels muted by the overcast afternoon sky. The house is funereal—even with scores of windows and colorful art glass all around. The tour group asked questions of the docent in hushed tones. The guide didn't much lighten the mood by sharing that Dana had squandered her father's mining fortune over the course of her life. The early death of her young husband may have been what drove her into seclusion, where she became obsessed with spiritualism and the occult. Later she was hospitalized due to dementia and died in care, leaving behind massive debt that was paid with the sale of the home and much of the Wright-designed furniture. From the mansion, I plodded along the splintered sidewalks of the Old Aristocracy Hill neighborhood, its once-regal Victorian homes in various states of disuse and disrepair. The name of the nearby Mansion View Hotel now seems ironic considering that the property next door is a shambolic single-story house no doubt abandoned for years. Around Halloween, it'd make a fine state-government-themed haunted house starring zombie legislators and chain-saw-wielding lobbyists. Finally, it was time to boldly go into the heart of darkness: the Illinois Executive Mansion. I envisioned bumping into the governor traipsing through in his house slippers while chewing on a golden pipe. I'd ask him why he's using his personal fortune to renovate the crumbling 160-year-old building while neglecting the rest of downtown—and the whole state, for that matter. But alas, the black gate of Rauner's crypt was locked. A sign stated the mansion was open on Saturdays, from 9:30-11 AM. Critics say cybersecurity expert John Bambenek wouldn’t even count as faculty at most colleges.